Amongst the many calls for help we get one that crops up quite frequently concerns how to remove, or fit, fan-blade hubs held on by taper bushes. Included in this category is ‘My fan-blade has come loose and nearly came off the shaft. I’ve bashed it back on but it is still loose how do I tighten it?’ or ‘I want to fit a new fan cage as the old one is mullered and I can’t get it past the hub’. So here is a quick(ish) guide to the things. Almost all fans use Honda engines fitted with a straight shaft incorporating a parallel key, the bit of flat metal that sticks up and the hub locates over. 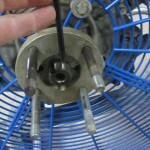 Its pretty obvious that without a step in the shaft to stop the hub sliding back, along with the huge variety of fan guards and fan-blades fitted some adjustment of the hub position on the shaft is required. 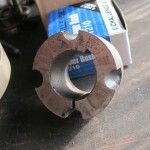 Enter the very clever two piece taper bush. The concept is simple. The big outer bit that the blade bolts to is the hub. Its inner face is tapered and accepts an opposing inner tapered bush that also has the groove cut in for the parallel key on the shaft. 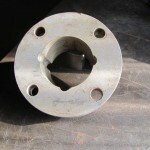 The hub has half threads cut into two opposing grooves that accept Allen screws. The corresponding grooves in the bush have two plain grooves that run about three-quarters of the way down the sides and additionally the bush has a split in it. When you push the bush into the hub and insert and tighten the Allen screws you are effectively pushing the tapers together and closing the split which fractionally reduces the internal diameter of the bush and thus it grips the shaft. Now, although the system is pretty foolproof and not normally prone to coming undone, a damaged blade can cause vibration which may loosen the Allen screws and, in some extreme cases, cause the taper bush to crack in half. 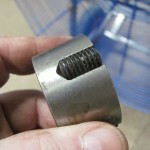 Even if the taper bush cracks it doesn’t normally cause the assembly to move providing the Allen screws don’t loosen. If the prop is loose on the shaft then simply tightening the Allen screws should do the trick however you will need to remove the blade and remove and clean the Allen screws before refitting them. These days of most cameras having a phone built in it can help if you photograph each stage as you go to help you remember how it all came apart if you think you’ll forget! 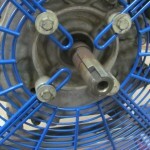 So, to remove the prop and hub the first thing you need to do is remove the front fan-blade guard and prop. It helps if you mark where the screw clips go that hold the two halves of the cage together before you undo them. Once that’s off you will be able to unbolt the prop and get to the hub assembly. If you have a gander at it you will see that there are three or four drillings with two opposite ones containing Allen screws. These are pulling the taper together and have to come undone. Lock the shaft with a decent screwdriver, or tyre lever, between the prop bolts and using the correct Allen key (usually Imperial) unscrew the two Allen screws. Take one of them and pop a drop of light oil on to it (including the pointed end) and screw it into the intermediate hole that has a thread cut into the taper bush only and tighten it as much as you can without getting violent with large hammers. This action will push the tapers apart. Now it might just go ‘crack’ and the darling come apart but if it doesn’t then once good and tight, with a decent punch and hammer, firmly tap the outer hub (not the inner bush) opposite the Allen screw. If nothing happens try and tighten the screw a bit more and tap the hub again. The outer hub should suddenly come loose and drop back. Unscrew and remove the Allen screw. If nothing will budge then remove the Allen screw and take two decent copper hide hammers. 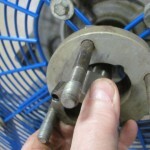 Place one against the outside edge of the hub assembly and strike the opposite side with the other one. This should do the trick and free the taper. This can be the tricky bit. You cannot draw the hub over the bush as the taper won’t allow it. Now, if you are lucky you should be able to get your fingers behind the hub and onto the bush and gently pull it off the shaft but in reality it often isn’t that simple. What tends to happen is that the bush gets a smidgen of corrosion between it and the shaft and won’t budge. What you need to do is try and drift, or lever it, off from behind. Don’t try and get it off by levering the outer hub, all this will do is lock the bush tighter onto the shaft as the tapers tighten. It is difficult to get a drift behind the taper bush so what we do is use a small curved jemmy against the inner cage bolts and onto the back of the taper bush and gently lever it off. If you haven’t got one of them then find a small socket that won’t interfere with the hub and lever against that. Don’t go mental trying to get the taper bush off as you don’t want to end up with a bent shaft! If it soon becomes apparent that the little devil is not going to budge then you can try warming it with a blow torch (being careful not to play flames over the petrol tank or crankshaft seal) or take an old screwdriver or thin chisel and gently tap it into groove on the bush and introduce some WD40 (other brands available). This will do one off two things. The bush will loosen and you’ll be able to ease it off or it will crack across the opposite threaded slot. If it does break (or is already broken) then its not the end of the world as inner bushes can be purchased separately and are pretty cheap (quality ones around a fiver plus any postage). Let us assume you won and managed to get the taper bush off the shaft and having fitted a shiny new rear guard you are going to put the hub and blade back on. Firstly make sure the shaft is clean and dry. Ensure the tapered faces are also clean and dry and free from oil. 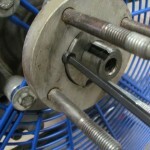 Depending on the type of hub and prop fitting make sure that any prop bolts are clean, undamaged and in place. You are now going to fit the hub and bush as one unit. 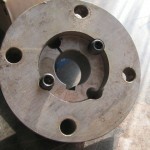 Push the taper bush into the hub ensuring that the threaded slots on the bush align with the plain drilling on the hub. If you look down the holes you should only see thread on the inner taper bush. Lightly oil the Allen screws, including the point, and loosely screw them into the holes until they just start to go tight. The unit should now hold together. Align the slot for the key with the key on the shaft and push the unit onto the shaft. If it requires belting with a mallet slacken off the Allen screws a bit. If necessary gently tap the face of the bush to get it onto the shaft. It should go on with the minimum of force! As it goes on the bush will nip the shaft then the hub will be slightly drawn on to the bush. Offer the prop upto the hub face and check that it is in the correct position with regards to the cage and that isn’t going to foul it. This is usually central. Once you are happy with the hub’s position then alternately tighten the Allen screws until they are jolly tight. Take a block or sleeve (a large socket will do) and place it on the face of the bush and bash it a couple of times to ensure that the bush is centred properly and try and tighten the screws a bit more. 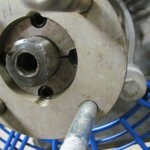 If further tightening is required repeat the process a couple more times until the correct torque setting is achieved. You can now refit the prop (fitting new nyloc nuts if appropriate) and guard then fire the old girl up. There should be no movement fore or aft of the prop assembly. After a couple of runs then whip the cage and prop off again and recheck the Allen screws. A splodge of grease on top of the Allen screws will help prevent corrosion. 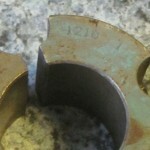 In the event that the taper bush is broken or damaged it can be identified by a number on the front face alongside the cut out. 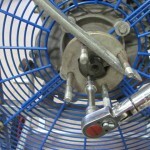 Most of the fans use a 1210 or 1610. You will also need to measure the diameter of the shaft (usually one inch) and specify the number of holes (usually three/four). 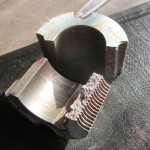 We use Challenge Taper Bushes but there are others such as Taperlock. Don’t buy cheap Chinese ones as the taper tolerances are often wrong. Don’t assume the measurements here are correct for all applications, you do need to check before ordering as engines are supplied with various shaft dimensions. 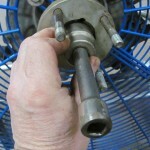 Always try the taper bush on the shaft before reassembly. If it is obviously too tight or too loose then it is wrong. It should go on with the smallest of pressure. If it is definitely the correct one then check the shaft for damage, remove the parallel key and give it all good clean with Emery paper. Make sure the key goes back in the same position it was removed from and is fully home in the groove. If you lose the key or it is broken or damaged then you must ensure that the replacement is a parallel key with top clearance otherwise there is a strong chance that the taper bush will not grip the shaft properly or simply won’t go on. The torque setting for the most common 3/8 BSW threaded Allen screws is 20Nm. The ¼ BSW is 5.6Nm and the larger 7/16 BSW is 30Nm. There are plenty of people selling the taper bushes online and prices start from around £3.00 plus postage but ensure that they are cast iron and of decent quality. Our advice is to spend a bit more and ensure you get ones that will do the job properly. We use Bearing Traders but beltingonline do the full range including the less common sizes.